A short account of anarchism in Greece from the early movement up to the December unrest. Written by Athens-based anarchist communist group "Eutopia" for the Biblioteca Franco Serantini in September 2009. This text has been edited to improve the translation. During December 2008, Greece was at the centre of international news reports. The murder of a 15 years old student in Exarchia led thousands of enraged people - in an unprecedented number of cities and even villages - to clash with police forces, attack police stations, banks, enterprises, corporate and state buildings, occupy universities, municipal buildings and even the opera house of Athens; forming a picture of social insurrection, but nonetheless failing to have a decisive impact on the workplace. From the incident itself up to the gradual subsidence of the wave of anger, the presence of “anarchists” was an important factor, not implying of course that they were the sum of the explosion, rather a fuse that sparked these events. Such a factor is important in giving rise to a new and stronger international anarchist movement. Through both historical study and our own observations, we will try to shed a light on these new developments, which we consider to be interesting not only as a means of improving anarchist-antiauthoritarian discourse and action in Greece, but also the European, Balkan and Mediterranean movements, Greece finding itself at the crossroads of these three regions. In the Hellenic region, anarchism did not have a parallel blossoming over the same time period as an important revolutionary movement as it did in many other European nations. In this southern most part of the Balkans, “Greek anarchism” didn’t really appear until the second half of the 19th century, where it gained influenced on the Ionian Islands and in the harbor of Patras, regions that had a high proportion of Italian immigrants. The ideas of Proudhon, Bakunin, Kropotkin and others were, however, of great influence on socialist thinking of that time. As is mentioned in a letter by the anarchist group of Pyrgos (a small town near ancient Olympia) “anarchism was already present here in 1892”, while later on in the same letter it is noted that at the end of 19th century and the beginning of the 20th there aren’t any authoritarian socialists (referring to Marxists), but rather “conservative, liberal and anarchist” socialists. According to Marxist historians, the weakness of the disparate Socialist groups that existed at that time, which were quickly absorbed as sections of the First International, along with the schisms that already existed within the International, combined with the appearance of Marxist ideas c.1912, signaled a shift in Greece from “utopian” to scientific socialism. Anarchist ideas begin to recede and to had no discernable impact on the labor and rural movement from the ‘20s onwards. Anarchism in its classic form ceased to have any influence on the major social struggles within Greece. Accordingly, we cannot claim the existence of an anarchist tradition in Greece with a common heritage to the modern anarchist movement, either through experience, struggle or theory. Anarchist ideas emerge again in 1974, after the fall of the military junta regime. This time they are imported from European countries like Italy, France, England and Germany (mainly from Greek students returning to Greece). These ideas begin to evolve in sections of the Greek youth, mainly in universities, and are discernible from the influence of Marxist ideas as their foundation becomes explicitly libertarian. However, these ideas and the means by which they are expressed, their tactical and organizational approaches, bear little resemblance with the “classical” anarchist movement. The main influences are the Parisian May of '68 and the situationists, the movement of autonomous occupations and armed organizations of Western Germany, as well as the autonomists in Italy. The spread of “anarcho – autonomous” (anarchoautonomoi) ideas in the universities through the late ‘70s gives the anarchists centre-stage as well as leading to the so-called “wild youth” in Exarchia throughout the 1980s. During the late ‘80s and the '90s,there are perhaps two basic characteristics of antiauthoritarian-anarchist action, the idea of insurrectional violence on the one hand, and the growth and practice of occupations on the other. As is cited in a text written during of riots of December, “the basic element of the anarchist movement in Greece, since its new beginning is the question of the state’s legal monopoly of violence”. This and the right to resist, which is also advocated, other elements mentioned in the same text include: “self-organisation of the struggle, questioning of the organization of everyday life, absence of mediation of (either struggling or not) subjects, autonomy by means of collective decision making (through assemblies and direct democratic procedures, the main tactic being consensus and refusal of the rule of the majority)”. The strategy/tactics or, to be more precise, the mentality most Greek anarchists have in common, is not one that complies with the vision of the “great anarchist organization” (with two exceptions, one in the ‘80s and one in the ‘00s). Anarchists operate and organize through small groups or “cores”, whose basic goal is to contribute to social antagonism/rivalry leading to a true social rupture characterized by violent conflict/confrontation. Perceptions/beliefs of the situationists, practices of the Autonomen and the everyday struggle of the zapatista communities have influenced (and still do today) the way anarchist groups conceive their action and practice. These influences are identified with representative figures of so-called post-anarchism (e.g. J. Adams), who pay much more attention to the everyday practices of the activist groups than the political struggle itself in forming a political-ideological whole. During the last decade, we can point to a growing presence of anarchists, both in the issues and approach of several groups as well as in terms of geographical location. A more “persistent” engagement with local-ecological issues and focus on what we could define as “local libertarian action”, mainly through the action of anarchist-libertarian social centres in various neighborhoods of Athens and other major cities created the conditions necessary to form “bridges” of self-organised resistance with local communities. Of course, this has only been made possible where libertarian expression has originated from members of the local community itself. This systematic engagement with local-ecological issues was started mainly by small core groups of comrades characterized by a more libertarian- anarcho-communist approach, in their attempt to shape/form broader conditions of self-organised social struggle in a certain “front”, accompanied by a fierce critique of the ideology of development. At the same time, the influence of the action of organizations like ALF(Animal Liberation Front) and ELF(Earth Liberation Front) from northern Europe and America, played an important part in the establishment of what we could call eco-anarchist action, as expressed through several groups. The environmental-ecological issues rose as a primary field of anarchist action, especially since the Olympic Games of 2004 and afterwards, and they are always combined with criticism of the capitalist system, the state and political partners, while social ecology also offers useful analysis as an approach in itself. While the ecological issue is established in the collective conscience of anarchists as an important and inseparable part of the social struggle, autonomous labour/working/workers’ action is also starting to make some new, important steps. Undoubtedly the efforts of some autonomous workers to combine direct action with industrial unionism through horizontal forms of organization in the courier/delivery profession are an important point of reference. This effort has shown a way of forming primary unions, where anarchists and members of the so-called “extreme left” play an important part. The presence of such organizations shattered the image of the labor movement as completely controlled by professional trade unionists, as expressed by members of PASOK and the Greek communist party. These two developments that have been growing the last five to ten years are mentioned because they are related to the December uprising/insurrection in two ways: they pushed the insurrection further and they were pushed further by the insurrection. One of the conclusions drawn from last December’s insurrection is that the libertarian vision of direct democracy and self-governing on a communal scale stood as a guide for further action, which was not spread via representatives or electoralism, but through the conditions of that temporary community of insurrected people. The insurrection brought up these ideas and they were spread through the society by means of the insurrection, in a very similar way to the kind of mutual relationships established in Argentina and Oaxaca five and three years ago respectively. On December 11, the occupation of the Aghios Dimitrios town hall and the subsequent call for an open, popular assembly gave the chance to more than 300 people to discuss what was going on at the time, thus opening a broader public space for discussion and collaboration (it should be noted that there is also a libertarian social centre, which has a decade long history of community activism, active in this specific municipality). In this assembly several opportunities, either in a realistic or in an imaginary level, were presented: gathering and meeting of many people was possible through the procedure of the assembly held in a town hall occupied by anarchists – these people either participated in street clashes with the police forces or expressed their anger for the murder of Alexandros Grigoropoulos but couldn’t be on the streets because of their age – some were just interested in the procedure, or pretended to be for their own reasons. During the assembly anyone could express his/her opinion (even the vice mayor), but this didn’t mean that this procedure ceased to be characterized as a meeting of people who struggle. In these assemblies the social anti-violence, the destruction of banks, state and corporate buildings and the clashes with the police that took place were advocated openly, in public and by name (since we are speaking of a local town hall). There was also sabotage of the ticket machines in the subway as authorized by decision of the popular assembly. For a few days the city council was denied access to the town hall. Before this occupation, nearly all occupations took place in university buildings, where the police cannot easily enter, due to legal reasons. This time the responsibility to opt for a violent eviction was laid in the hands of the city council, which meant that they had to turn against many inhabitants of the region/municipality. Discussions were held among the occupiers and the people who work in the municipality services about the possibility of running the social services, proving that community control and workers control can be combined. Through this experience, anarchist and libertarian practices, as well as the presence of the comrades in this area, were strengthened, thus pointing to the idea that continuity of action in a certain social field and persistence in promoting self – organization and resistance can help the anarchist ideas to be established at a local level. 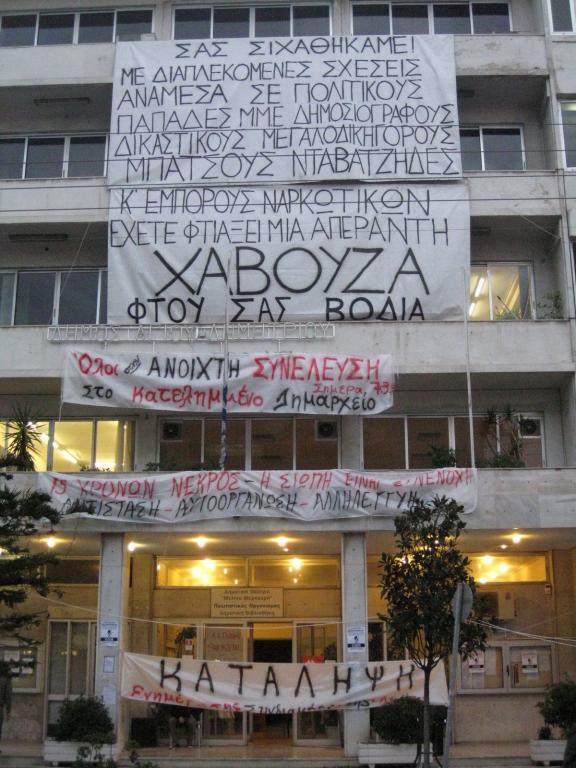 The idea of occupying town halls and other municipality buildings and running open assemblies spread in other regions of Athens and Salonica in December 2008, initially by initiatives held mainly by anarchists, but soon enough followed by members of organizations and parties of the left. Alongside libertarian intervention at a municipality level through occupations and assemblies, workers action against bureaucratic trade unionism found expression in the occupation of the central offices of the General Confederation of Greece’s Workers on December 17. Members of the primary unions, mentioned before, and members of independent workers organizations formed the General Assembly of Insurrected Workers, aiming to push the message of the insurrection into the workplace. Parties and trade union bureaucrats found themselves in an obviously unpleasant situation, where political forces that they categorized as “marginal” for years had now achieved bringing forward the idea of self-organization through rupture with the dominant institutions, both in the municipality and via independent class action. This occupation triggered a series of other occupations of formal workers’ centers in other Greek cities, especially after the attempted murder of the immigrant trade unionist Konstantina Kuneva. It is obvious that all these movements had their limitations, since normality and regularity returned. Still, there are some “cores” of resistance that persist in trying to find the right direction through continued criticism and action. The incidents/events of the last December, and the period after it, “revealed” a relatively large number of people who are interested in anarchist ideas or are willing to participate in the practices that anarchists develop, but wouldn’t normally participate in any form of self–organized group or centres, because they are afraid or not willing to take on the responsibility or simply aren’t yet fully convinced. Elements of anti–authoritarian discourse can be identified in a large number of news stories and texts concerning occupations, social centres, anarchist groups, local movements, arson attacks and even armed attacks. This variety of things, actions and discourse does not constitute one solid entity, but also does not imply on the other hand a “war” between different approaches or realities. What is missing is a coherent political conversation, not aiming of course to replace activism, but to empower it by offering a more substantial content, in order to avoid confusion and help the directions mentioned before take a more illuminated path to social liberation.